It's more than just LTE. Apple Watch Series 3 can now work without an iPhone nearby. The biggest change to Apple Watch Series 3 is LTE. 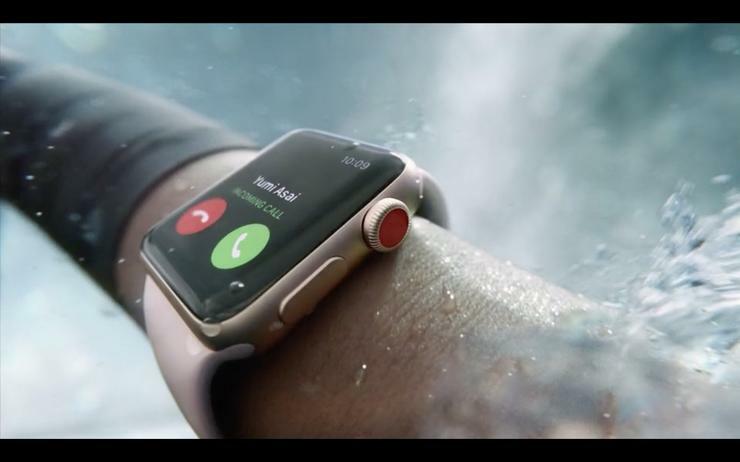 Where previous Apple Watches needed to have a phone nearby to do most things, Apple Watch Series 3 with LTE is completely independent, letting you get calls, messages, and alerts even when your phone is hundreds of miles away. But what’s most impressive about the new LTE Apple Watch is its size. Thanks to an electronic SIM and engineering that uses the display as an antenna, Apple manufactured Apple Watch with LTE without increasing the size of the case. Considering the LTE Android Wear watches we’ve used, that’s no small feat. 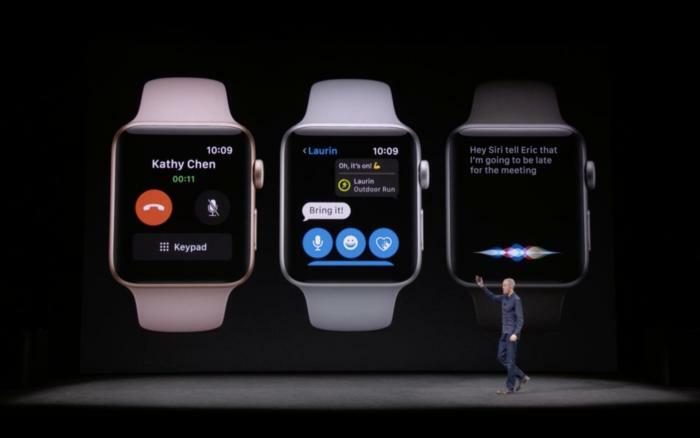 And what’s more, you can use your existing number with your new Apple Watch. There’s an LTE chip and an all-day battery inside the new Apple Watch Series 3. One of Apple Watch’s most underrated feature has always been it’s battery life. Lots of smartwatches claim to deliver all-day battery life, but Apple Watch actually delivers on this promise, sometimes even pushing well into a second day of use. We were skeptical that Apple could keep the same 18-hour battery life with LTE, but thanks to new power-efficient S3 and W2 chips, Apple promises that Apple Watch will last just as long. Siri on Apple Watch Series 3 has been greatly improved. Apple Watch has always been smart, but it’s learned a whole lot for Series 3. It starts with Siri. We’ve already seen the Siri watch face in watchOS 4, which delivers a steady stream of personalized updates to your wrist, but always-on connectivity with LTE makes it much more useful. And on Apple Watch Series 3, Siri can now talk back. When you ask Siri a question using your Series 3 watch, you won’t have to look at your screen anymore—it will respond to your query using your watch’s speaker. One of Apple Watch’s main purposes has always been health, and Series 3 only reinforces that mission. Not only is there watchOS 4, which brings a new Workout app and the ability to sub your metrics with gym equipment, the heart rate sensor will now tell you your resting and recovery BPM as well. 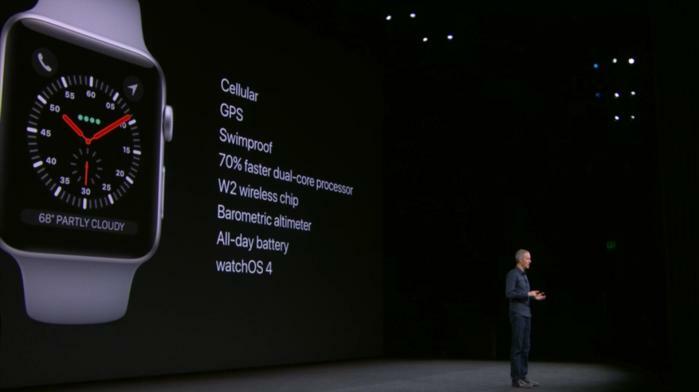 And the Series 3 watch now also has a barometric altimeter for more accurate elevation readings. And of course, you can still take it swimming. 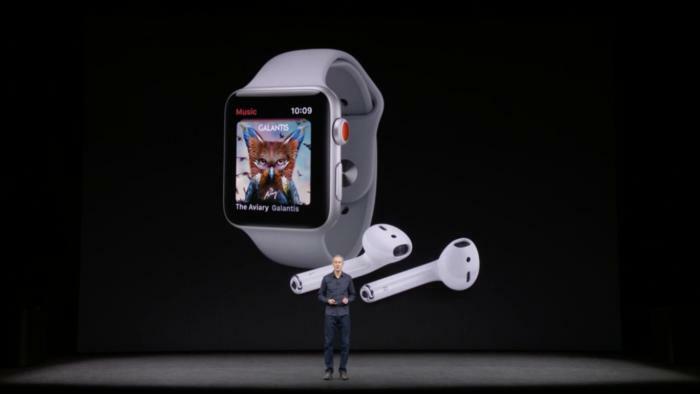 Apple Watch Series 3 and AirPods, perfect together. Apple Watch has always been able to store music, but with just 2GB of available storage, it held fewer songs than the original iPod. But that changed with the LTE chip. Now the entire Apple Music catalog will be right on your watch, and you won’t have sync playlists to make sure you have the latest Taylor Swift track. It’s like having 40 million songs on your wrist. We don’t usually think about performance when it comes to Apple Watch, but with an LTE chip, it’s going to be more important than ever for apps to load quickly. A new dual-core S3 processor brings a 70 percent boost in performance, and the W2 Bluetooth chip brings 85 percent faster Wi-Fi and 50 percent power efficiency, which is necessary because the LTE chip will use lots of battery life. 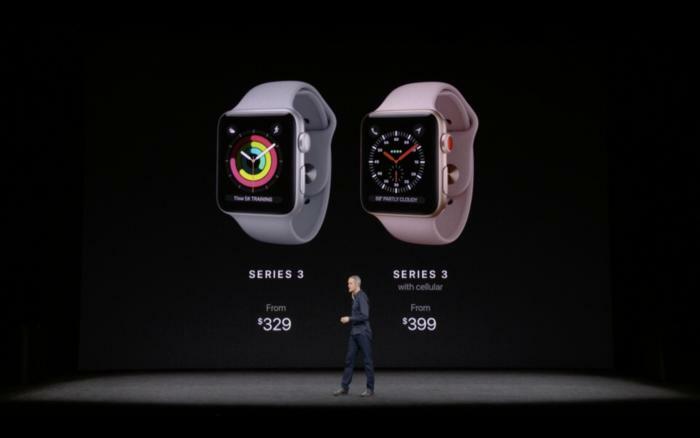 Apple Watch Series 3 starts at US$399 with LTE. 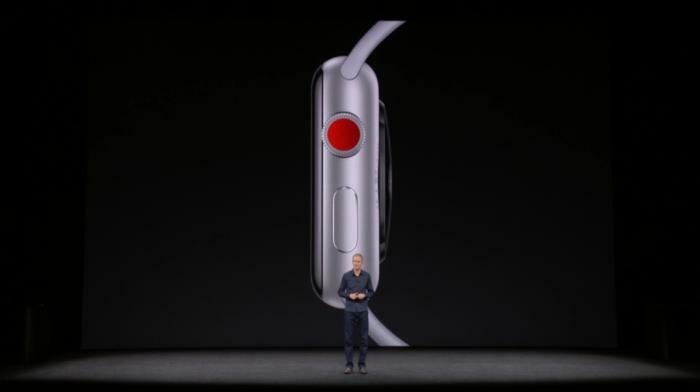 The Apple Watch Series 3 with LTE connectivity will start at AUD $559. The version without LTE will start at AUD $459.